I once boldly stated without checking that Gram Parsons had more books written about him than anyone else who died by age 26. Someone did their homework and corrected me: King Tut and Anne Frank evidently have had more (perhaps others). By pointing to such notables from history, I think this critic made my case. 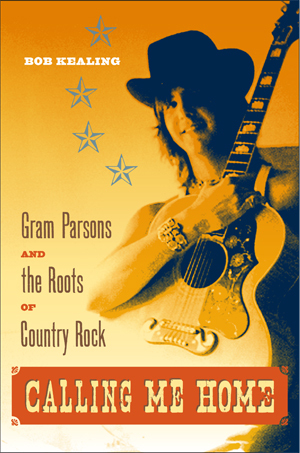 So, why another book about Gram Parsons? If you throw in the Gandolf Hennig movie, one wonders what more one could know about this gentle though brightly shining comet that seemed to come out of nowhere and burn out far too quickly for most to see on the horizon. Turns out a journalist from Florida now gives us the reasons why. Seems there actually were parts of Gram’s life that had not been thoroughly explored and people who were close to Gram that had not said much before, possibly because no one thought them important enough to talk to. Bob Kealing sensed their stories untold, and they opened up to him. It took a journalist with Bob Kealing’s cred and easy manner to uncover these friends, relatives, and band mates and their informative tales. How? Like any good journalist does: by going after the story. By finding those folks, and squeezing all he could from them without them even knowing he had done so. By taking the pieces, putting them together, and going where the story took him — with no preconceptions based on previous works or even on a complete knowledge of Parsons’ catalog. And perhaps most importantly by nature of being a journalist who shared a homeland that Parsons loved and that informed his art; where others covered Gram’s early years in the South mainly from the viewpoint of his tragic family background and left it there, Kealing found there was much more to discover and share with us. 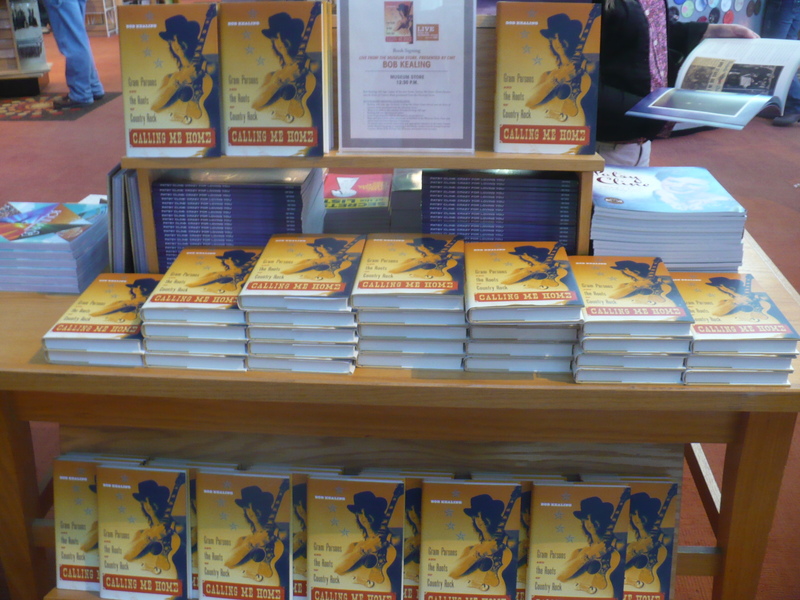 Display of “Calling Me Home: Gram Parsons & the Roots of Country Rock” at Bob Kealing’s book signing at the Country Music Hall of Fame. The author, therefore, mercifully doesn’t spend much time on the death and next to none on “the caper.” Kealing concludes with an account of one of the annual Waycross events a couple years ago that he attended. The late great Charlie Louvin headlined the bill; he had recently put the Country Music Hall of Fame medal around the gorgeous neck (sorry for editorializing) of Ms. Emmylou Harris. Also there was “Hickory Wind” co-author and Parsons band mate Bob Buchanan. They met and shared stories on the steps of the old Waycross City Aud where Gram had been inspired by Elvis as a youngster. In doing his research, Kealing has uncovered some surprises along the way, and I’ll leave it to the reader to find them. As a historian and one fascinated by the early days of rock as it merged with folk and country, the stories alone about Florida’s youth centers and the region’s rich heritage from garage bands to Coconut Grove, where Gram’s idols and peers often hung out, including Bob Buchanan, the great Fred Neil, and others like John Sebastian, are priceless. It takes an award-winning journalist such as Bob Kealing to tie all this together with final events such as the historic Houston Liberty Hall Fallen Angels concert to complete a portrait of a seminal artist as a young man right up to the time of that still young man’s death. Five years ago when this reviewer began the Gram InterNational concerts in Nashville, it was held on the date of Gram’s death. I used a picture of a Joshua Tree as the background for the poster. Several years ago I moved the event to Parsons’ birthday, and this year a lush green setting with a large live oak provided the backdrop for the poster. The parched desert that holds the stars together overhead joins with the South, where the verdant land “trembles and it shakes until every tree is loose,” to form a metaphor for the whole of this American original, and it’s nothing but a good thing that the entirety of his short but undeniably influential life is now being explored. “Calling Me Home” does much to take that exploration beyond metaphor. Addendum: This book dropped in September of this year (2012), one month before the annual Gram tribute in Nashville known as Gram InterNational, an event dedicated to Parsons’ proposed induction into the Country Music Hall of Fame alongside Emmylou. It was quite a night with Bob Buchanan singing “Hickory Wind” and Fred Neil’s “Another Side of This Life.” Jock Bartley, former Parsons band mate on the Fallen Angels tour and guitarist with Firefall, performed as well. Walter Egan of “Magnet and Steel” fame and who was present at the first meeting of Gram and Emmylou performed his fifth annual (see http://bit.ly/Tpbv0M for video of all this) . Tailor to the stars Manuel Cuevas was also there to everyone’s delight. 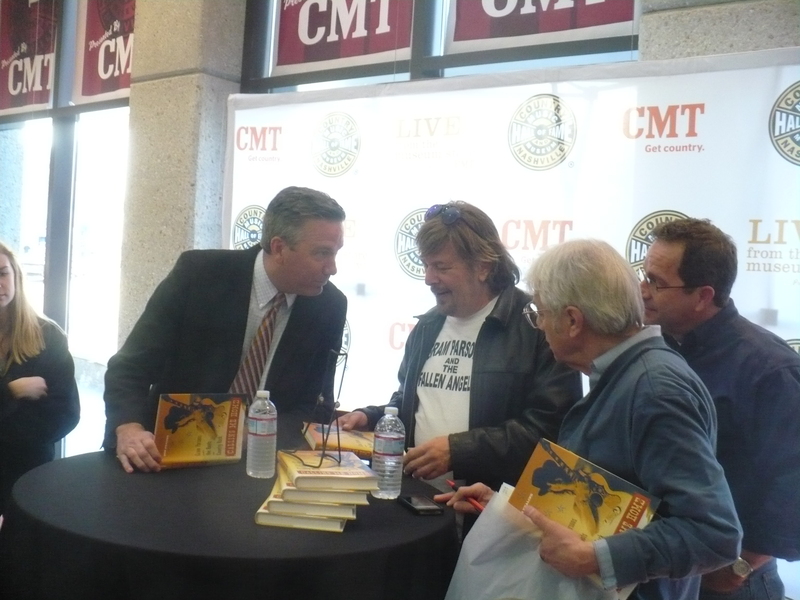 But of even greater significance, the Country Music Hall of Fame invited Bob Kealing to sign copies of his book at the Hall the following day. Long lines formed to have their copies of “Calling Me Home” signed while Gram and Emmylou’s music played throughout the room. As the sun shone brightly through the windows on the glorious wall of gold and platinum records, it indeed seemed to all of us who were present like the momentous occasion it actually was. This is a most excellent review of a most excellent book, WJ. Bob Kealing took a part of Gram’s life, that no one touched upon, and made it as fascinating as what sadly, happened later on, and what’s most shocking..is this story is not over yet.Being a ‘Grampyre’ or whatever rubbish they call it, I eagerly await a follow up to this most fascinating tale!! Will, what a wonderful review! I plan to get this book soon and very soon. I really enjoyed meeting Bob at our GIN V in Nashville earlier this month! Take care, my friend! I hope this one adds to the terrific PERSONATA of the MAN…..